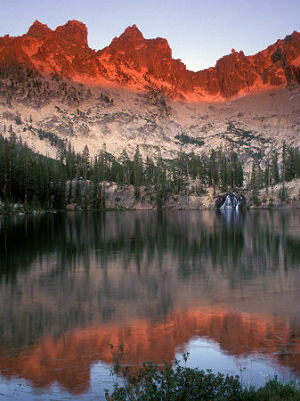 Welcome to Idaho, a land of rugged beauty and millions of acres of wilderness. With a landscape that ranges from subalpine to desert, granite mountains to fertile farms, lakes and waterfalls to canyons and gorges, Idaho is a study in geographic diversity. Hell's Canyon, at 7900 feet, is the deepest canyon in North America, deeper even than the Grand Canyon. And the Shoshone Falls, on the Snake River, are higher than Niagara Falls. The Idaho potato is known around the globe, and two thirds of all the processed potatoes produced in the United States are grown in Idaho. Idaho has the greatest stand of white pine trees in the country. The state is first in the country in production of silver. In addition to silver mining, gold, lead, zinc, and copper are all produced in Idaho. Idaho was first presented to Congress, by mining lobbyist George M. Willing, as a name for a new territory around Pike's Peak. He told Congress that Idaho was a Shoshone Indian word that meant "Gem of the Mountains." Indian names were popular at the time and by the end of 1860, Congress was set to name the Pike's Peak region Idaho. Just as Congress was about to bestow this name, it came to their attention that Idaho was not an Indian name, but a name made up by Mr. Willing. In reaction, Congress designated the territory Colorado instead of Idaho. In the meantime, the word Idaho had come into common usage. One of the mining towns in Colorado Territory had been named Idaho Springs. A Columbia River steamboat launched on June 9, 1860, for service between the Cascades and The Dalles, was named "Idaho." Gold was found in Nez Perce country, and these discoveries became known as the "Idaho Mines," perhaps after the steamboat used in the gold rush up the Columbia River. Though Idaho had been discarded as a name for the new territory, the name became well known from Washington D.C. to the Pacific northwest. In 1863, Congress created a new territory for the Idaho Mines and the name Idaho seemed like a natural. This nickname for Idaho grew from the meaning George M. Willing gave to the word when he made up the name. Similar to the above, Mr. Willing told Congress that Idaho was an Indian word meaning "Gem of the Mountains." This old nickname probably came about because Idaho is smaller than most of the other western states. People who live in Idaho or who come from Idaho are called Idahoans. In the days of the gold rush, Idahoans were sometimes referred to as "Fortune Seekers" because of the number of people who went to Idaho to find wealth in gold and silver mining. The third commemorative quarter-dollar coin released in 2007 honors Idaho, and is the 43rd coin in the United States Mint's 50 State Quarters® Program. 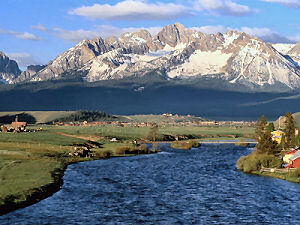 Idaho, nicknamed the "Gem State," was admitted into the Union on July 3, 1890, becoming our Nation's 43rd state. The reverse of Idaho's quarter features the Peregrine Falcon imposing its presence above an outline of the State of Idaho. The coin bears the inscriptions "Esto Perpetua" (the State motto which means, "May it be Forever"), "Idaho" and "1890." The Peregrine Falcon is one of the fastest birds in the world. Once on the endangered species list, it can now be found throughout Idaho and the United States because of conservation efforts. Five narratives were forwarded to the United States Mint, and they were rendered by United States Mint sculptor-engravers and artists in the United States Mint's Artistic Infusion Program. The corresponding design images were presented to Idaho, and then-Governor Dirk Kempthorne made the recommendation. Governor Kempthorne stated that the recommended design, the Peregrine Falcon, reflected Idahoans' traditional values and esteem for nature. This design was derived from one of many narratives submitted by Idaho residents to the Idaho Commission on the Arts. The Department of the Treasury approved the design on June 26, 2006. Two other designs were considered, including "Farmland Tapestry," showing the farmland of Idaho with its majestic timber-covered mountains rising above, and "State Song," featuring the outline of the State and lyrics. On July 24, 2006, Governor Jim Risch and State Treasurer Ron Crane revealed to the public Idaho's quarter design. Idaho (From Sea to Shining Sea) , by Amy Miller. 80 pages. Publisher: Scholastic Library Publishing (September 2003) Reading level: Grades 3-5. Presents information about Idaho's people, geography, history, landmarks, natural resources, government, state capitol, towns and cities, and more. Idaho (World Almanac Library of the States) , by Karen Edwards. 48 pages. Gareth Stevens Publishing (February 2003) Reading level: Grades 4-6. Filled with the most up-to-date information, including the latest Census results. Full-color photos bring to life the story of Idaho. In addition to an in-depth factual profile of Idaho in the form of a state Almanac, this book offers fascinating and lively discussions of the state's history, people, geography, government, economy, culture, and lifestyles. A section on Notable People, a calendar of events, and enough primary source documents, time lines, maps, and other tools to make this unquestionably the best young adult reference material on the USA available anywhere. It Happened in Idaho , by Randy Stapilus. 128 pages. Globe Pequot Press (June 1, 2002) From its wind-swept plains to its snow-capped peaks, Idaho is a land of variety and splendor. It's also a place with a lively and colorful past filled with mountain men, Indian tribes, frontier families, renegades, and business tycoons. It Happened in Idaho takes readers on a rollicking, behind-the-scenes look at some of the characters and episodes from the Gem State's past.Here you'll read about the mistake that led to the founding of Idaho's first town, a mule that struck silver, the midnight theft of the capital, and the calamitous Teton Dam flood.Many of the people and events from Idaho's past are well known, but many are not. Do you know how Sun Valley, the first major ski resort in the United States, came into being? Or the story about daredevil Evel Kneivel's attempt to jump the Snake River canyon on a motorcycle? And how did Idaho potatoes become famous? In an easy-to-read style that's entertaining and informative, author Randy Stapilus recounts some of the most captivating moments from Idaho's history. Roadside History of Idaho , by Betty Derig. 480 pages. Mountain Press Publishing Company (December 1, 1996) Roadside History of Idaho "With quips and anecdotes, directions to towns and highways, this book was an adventure." Library Research Association, Inc. The best way to enjoy Idaho's rich heritage is to visit the sites where history happened. Roadside History of Idaho makes you feel like you've got a native guide at hand as it transports you to those places through well-researched, well-told stories and vivid historical photographs.